AVT Reliability have been providing Condition Based Maintenance support to Dairy Crest Severnside since 2011. Including vibration analysis, oil analysis, thermography, ultrasound and total lubrication management. In 2015 ADI took over the facilities management on site and retained specialists AVT to provide condition monitoring and lubrication services. 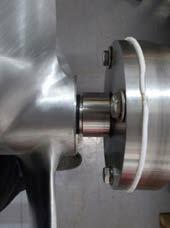 A recent example is where AVT Reliability’s CM Engineer highlighted a reoccurring issue with particular agitators; vibration analysis showed that the root cause was due to poor sealing causing bearings to prematurely fail. The MTTF of the agitator was 12 months, this had a financial impact of £19,000 for repairs and 40 hours per year in lost production. AVT requested aid from sister company AESSEAL who highlighted flaws in the seal design and came up with an alternative solution. 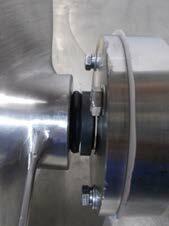 The solution not only improved reliability but the design reduced ‘Bug-Traps’ making it a more hygienic sealing method. So as an added bonus the agitator is now FDA compliant. To carry out the modifications the custom-made agitator was sent to AVT Pump for a full overhaul and machining. Oliver Mottershead, AVT Regional Team Leader said “it was not difficult to convince our client to go ahead with the upgrade… the evidence of premature failure due to seal issues was solid and the fact that we could provide an upgrade that included a warranty, together with the added benefit of FDA compliance was compelling for Muller Milk”. The agitator is undergoing a 6 month trial, when ended, if the seal has proven to be effective, these modifications will be rolled out to another 8 agitators. With the improvements made cost savings of £10,000 and 20 hours per year in reduced down-time are expected.